Three points from Jocelyn Lamoureux-Davidson steered the USA to a 5-0 victory over the Olympic Athletes from Russia. The result confirms that the Americans and Canadians will both advance directly to the semi-finals. 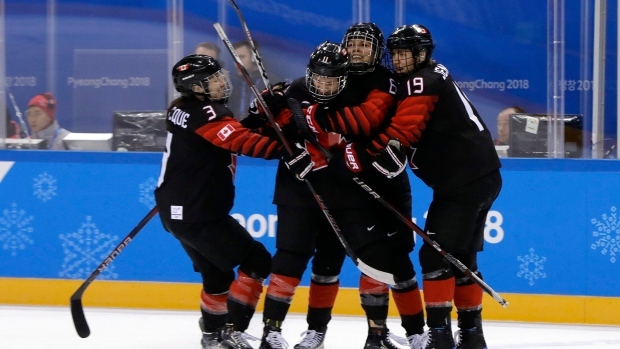 And her second-period blast of two goals in six seconds set a new Olympic record, bettering the 16 seconds that Caroline Ouellette needed to notch twice against Italy in 2006. The goals came just after the midway point of this game, and effectively ended the Russian resistance as the USA jumped to a 3-0 lead. Lamoureux-Davidson’s first was a family affair to make it 2-0, with Russian goalie Valeria Tarakanova left cursing her luck after a solid block on Monique Lamoureux-Morando’s shot dropped kindly for Lamoureux-Davidson to capitalise on hesitant defence and put the puck away. And the goalie had more grounds for anger at her team-mates from the face-off. OAR won the draw, but two players got tangled up over the puck and Lamoureux-Davidson nipped in to steal possession and win a one-on-one duel with Tarakanova. “There was a rebound on the first shot and it came through at the back door and I barely got that one in, then from the face-off I think their D just kind of miscommunicated and I was able to poke it through and walk in with quite a bit of space,” the goalscorer added. For the OAR team, which now faces a quarter-final encounter with either Switzerland or Sweden, this game echoed its opening match-up against Canada. For a long period the Russians were able to frustrate their opponent, but in the end the extra pace and power of the Americans told and the final scoreline was comfortable. Much of that early resilience was down to netminder Tarakanova and a hard-working defence. The goalie set the tone early with a fine pad save to deny Hilary Knight after Megan Keller’s deflected shot offered the forward a wide open net to aim for. But the early American pressure got a reward after eight minutes when Lamoureux-Davidson fed Kacey Bellamy in the right-hand circle. A shot through traffic left Tarakanova unsighted, and the USA had the lead. But that was not the beginning of the end. A hard-working display from the OAR team limited the Americans to just seven shots in the first period: a repeat of the 13-0 scoreline from the countries’ only previous Olympic meeting never felt likely. Indeed, there were hints that the Russians might even make a game of it. Yevgenia Dyupina drew a good blocker save from Nicole Hensley at the start of the second period, and Diana Kanayeva also tested the American goalie. But the bulk of the action was still at the other end, with Tarakanova making another good pad save to deny Dani Cameranesi. The same player then saw a looping shot clip the crossbar, prompting a big scramble as Tarakanova lay sprawled across her crease. Then came that game-breaking double blast, and a fourth goal wasn’t long in coming. Gigi Marvin slid the puck home after Amanda Pelkey’s shot was blocked, spelling the end of Tarakanova’s evening. Nadezhda Morozova, who started the game against Canada, came into the action with just over 25 minutes to play. Morozova produced a great save early in the third frame to deny Lamoureux-Davidson a hat-trick, and was saved by a video review in the 51st minute. Hannah Brandt thought she had scored when she swatted home the rebound from her own shot, but the video showed the American forward steered the puck into the net with her hand. Brandt eventually got her name on the scoresheet in the 59th minute, wrapping up after Cameranesi’s rush into enemy territory. While the USA can look forward to its place in the last four, the Olympic Athletes of Russia are in urgent need of boosting their offence. For the second time in three days, Alexei Chistyakov saw his team shut-out at the Kwandong Hockey Centre. More worryingly, the Russian players have managed just 29 shots in those two games. “We are creating some half-decent chances,” captain Olga Sosina insisted. “But somehow our finishing isn’t quite there. All of the forwards need to think about how we’ve played in the two games up to now, so we can do better against the Finns and turn the minuses into pluses. Melodie Daoust and Meghan Agosta each had a goal and an assist to help Canada down Finland 4-1 in Olympic women’s hockey play Tuesday. The U.S. played the team from Russia in the late Pool A game Tuesday with a U.S. win sending both North American teams to the semis. The top two in Pool A earn byes to the semifinals. The bottom two play quarter-finals against the top two teams in Pool B.
Canada had its moments both good and bad, looking sloppy on the power play at times. Marie-Philip Poulin and Jillian Saulnier also scored for Canada as some of the Canadian men’s team watched from the upper tier of the arena. After a rocky start, the Finns had their chances but could not convert them. Riikka Valila, Finland’s 44-year-old veteran, scored at 7:17 of the third, stuffing in her own rebound off an athletic Shannon Szabados save following a Canadian defensive letdown. Szabados then stopped Susanna Tapani on a breakaway. Finnish star Noora Raty had a busy afternoon in the other goal. Poulin’s goal, which made it 2-0 at 17:11 of the first, needed a video review for confirmation after the referee waved it off. After Jenni Hiirikoski lost the puck in front of goal, Poulin roofed a backhand that came out as fast as it went in. The review came at the next break in play. The Canadians thought they had a third with 4.5 seconds remaining in the period when a shot from Rebecca Johnston seemed to trickle in, with Natalie Spooner jabbing away from the edge of the crease for good measure. But the review went against the Canadians this time. Canada opened Olympic play with a 5-0 win over the Russian entry, with Daoust scoring twice. Finland lost 3-1 to the U.S. in its opener. At 2-0-0, Japan and Switzerland have already qualified for the quarter-finals out of Pool B. The Canadian women are after a fifth straight Olympic title. The Finns (0-2-0) are two-time bronze medallists. Canada’s record against the Finns at the world championships and Olympics now stands at 27-1-0 (6-0-0 at the Olympics). The Finns won bronze at 2017 IIHF women’s world championship in Plymouth, Mich., where they upset Canada 4-3 in the preliminary round with Raty making 35 saves. The closest Finland had come previously to beating the Canadians was a 6-6 exhibition tie in 1999. Canada struck early Tuesday with Daoust intercepting a Finnish clearance for a 2-on-1 opportunity. Daoust deftly delayed her pass to freeze the goalie and then slipped the puck between the defenceman’s legs to Agosta for a tap-in goal just 35 seconds in. After the early wobble, Finland found its feet, with Rosa Lindstedt ringing one off the post after taking a pass in the slot midway through the first period. And Szabados had to be sharp during a goalmouth flurry while Canada killed a penalty. Daoust made it 3-0 at 8:19 of the second, beating Raty with a low wrist shot through traffic after faking a slap shot. Saulnier padded the lead at 18:26 after being put in alone on a perfect pass from Johnston. Meaghan Mikkelson, a 33-year-old defenceman and three-time Olympian from St. Albert, Alta., marked her 100th international appearance for Canada.